Satellite imagery from Planet Labs SkySat platform shows a new crane installed at North Korea’s Nampho container terminal. The image — taken on February 26 — indicates continued infrastructure improvements to the area, despite a sanctions regime that should greatly restrict the volume of trade in either direction. 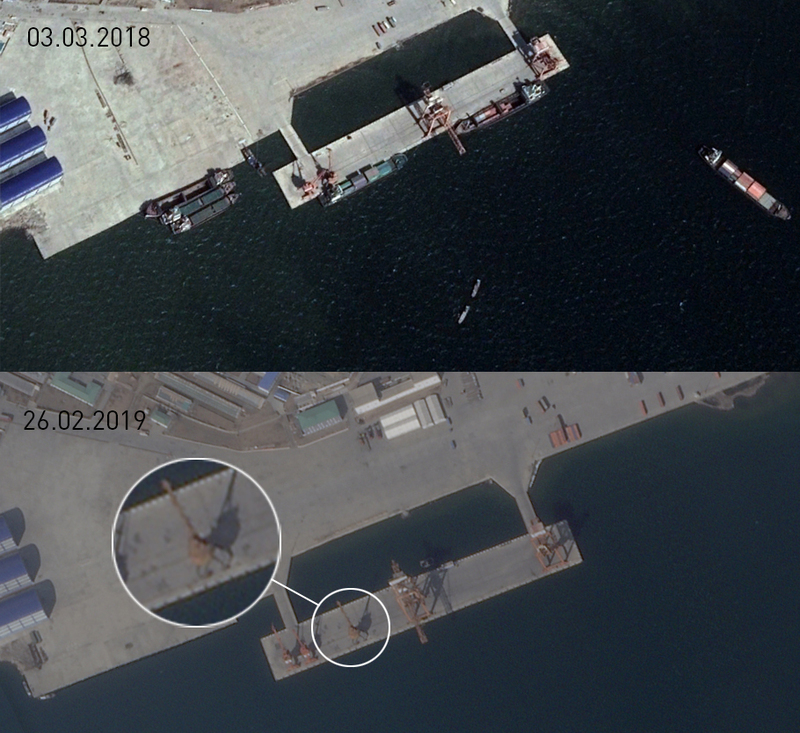 Comparing the recent February SkySat image to commercially available imagery on Google Earth from March last year shows an additional crane between a smaller pair on the western side of the pier and the larger crane in the center, bringing the total number to five. Historical imagery from Planet indicates the new crane was under construction from around the middle of last year and may have been nearing completion in October. The upgrade is one of a series of improvements in the area, which in recent years has seen new building construction, additional container storage, and the apparent addition of a new coal handling facility to the north of the container storage area. But the latest construction comes despite the imposition of a strict UN sanctions regime that may have cut billions of dollars from North Korea’s trade. The UN restrictions prohibit countries from exporting many items that may need to be shipped in containers, including vehicles, industrial machinery, and electrical items, while specialized containers can be used in order to transport practically any product or commodity. The prohibitions are also two-way and restrict North Korea from shipping its own machinery and industrial equipment abroad. While the upgrades may have been scheduled and carried out regardless of supply and demand considerations, the ongoing work at the facility mirrors additional construction at the Nampho oil terminal, just a short distance to the west. Previous NK Pro reports highlighted the rapid progress at the oil facility, which also now appears to have permanently expanded its loading and offloading capabilities, despite UN restrictions on oil products. According to the UN Panel of Experts (PoE) tasked with monitoring North Korea sanctions enforcement, Nampho remains a key area for sanctions-breaching activity and trade. “A Member State provided imagery of certain DPRK ports, in particular Nampho, as hubs for suspected illegal activity,” the PoE wrote in their most recent report. UN restrictions have certainly had little effect on the small group of North Korean ships shuttling between China’s Dalian port and Nampho, too. 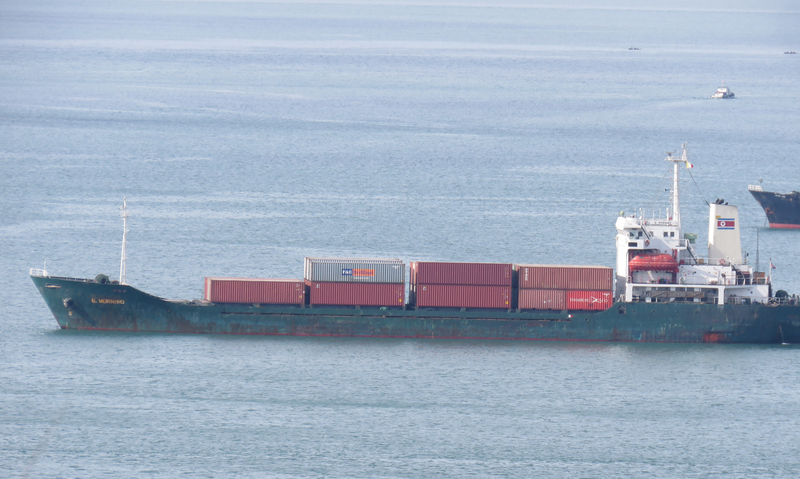 NK Pro obtained photographs of one of the ships — a vessel called the E. Morning — headed back to Nampho laden with containers, even though its joint Chinese-North Korean ownership and management should put in breach of UN resolutions. While the vessel itself is not sanctioned, it nonetheless displays several hallmarks commonly associated with the DPRK’s illicit maritime activities including frequent name, company and flag changes. Although not direct evidence of sanctions breaching, the E. Morning is a likely good candidate for a vessel carrying North Korean sanctioned cargos between two ports well known to handle them.